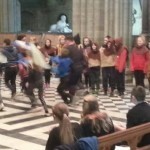 The Magna Carta “Play in a Day” project has got off to a flying start working with schools at Worcester and Liverpool Cathedral. As we await photos from each venue below are some of the comments we have recieved from participating schools. K Dobson (KJD) Dyson Perrins C of E Academy, Malvern. Aston Fields Middle School, Bromsgrove.